This year Yeovil Hospital has seen its highest number of patients signing up to take part in clinical trials. The Trust is celebrating recruiting 1,000 patients in just 10 months, giving patients the opportunity to help shape the future of how patients and their conditions are treated. The Clinical Research team at Yeovil Hospital is renowned for being very active despite its small size, participating in local, national and international trials. The team is currently running more than 120 studies, including more than 70 new research trials this year. 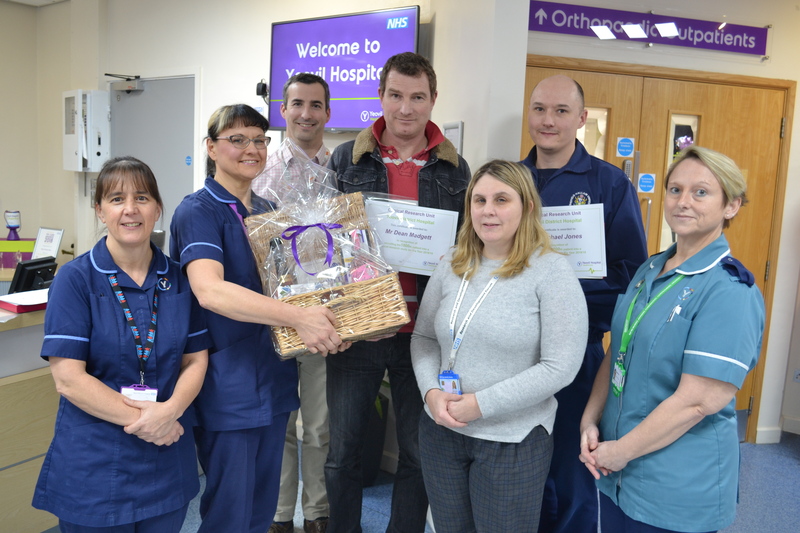 The 1,000th patient to sign up to support clinical research was Dean Madgett from Shepton Mallet who arrived at the hospital with a dislocated shoulder. Consultant Orthopaedic Surgeon Mr Oliver Donaldson specialises in shoulders and had just started the Artisan Trial with Senior Physiotherapist Michael Jones. The study looks at rehabilitation following shoulder dislocation. Oliver Donaldson said: “Dean was an ideal candidate to take part in the study so it was fantastic when he agreed to sign up. It’s very early days in the trial but we hope it will give us clear results that will significantly influence how we support patients with dislocated shoulders to recover in the future. The research team works with all specialties throughout the hospital and encourages patients interested in trials to ask if there are any opportunities open to them. Clinical Research Unit Manager and Lead Nurse Joanna Allison added: “There are so many opportunities and I really don’t think the public realise. If you come into Yeovil Hospital and your nurse or doctor doesn’t mention a trial, please do ask as our staff don’t always have the time to ask each patient and you may be exactly the kind of person we need. By letting us know you are interested, we can take a look at your conditions and see if there is a relevant trial running.